The Armenian Genocide is a story of malicious extermination and vicious killings, much like any other genocide. The way in which this genocide differs from most is that the aggressors, in this case Young Turks ruling the Ottoman Empire, do not acknowledge the killings as a formal genocide. This has caused much distain towards the Turkish nation from all regions of the world, and a lack of closure for the Armenian people. With such an injustice done to the Armenian people it would at least bring about some form of closure for the Armenians if the Turkish government would acknowledge their mistakes of the past and present a formal apology. Sadly it does not appear as if Turkish government will ever issue an apology in the foreseeable future. I intend to further prove the validity of this genocide through the investigation of it’s many images. The images I have chosen primarily focus on the Armenian children. The killing of children may be the best evidence for the genocidal nature of this event, as children are a symbol of innocence throughout most cultures in the world. The Armenian Genocide first started in 1915 and the killings officially continued until 1922. The total numbers of the extermination are debated but most historians agree that roughly one and half million Armenians were killed (Armenian National Institute, 2012). The killings were carried out by the then ruling group known as the Committee for Union and Progress. This group was comprised of Young Turks. Like many Genocides, this one took place during a time of unrest within the World. The genocide was veiled by the World’s preoccupation with WWI. The Turkish government counters claims of the genocide occurring by saying that the death toll of the event is greatly inflated and that the two groups were equally at war. They also say that what really occurred was an evacuation of the Armenian people from the war zone, and that there were casualties on both sides. Though some aggressors were eventually brought to trial and convicted the Turkish state to this day denies that the genocide ever took place and instead prefers to refer to the events as a mutual conflict between both groups. These statements are ludicrous and blatantly disrespectful to the Armenian people. If the accounts of the event do not affirm it’s genocidal qualities, the photographs of the defenseless child victims of the catastrophe surly will. There are many photographs of the Armenian refugees and the public hangings that took place. These photographs can be used as evidence that genocide occurred, but they could also be twisted and used as a way to show that the Armenian people were merely relocated and those being hanged were war criminals. Amongst these photographs there are some that stand out as indisputable images of genocide. These images that serve as irrefutable evidence are those of weak, emaciated child victims. Armin T. Wegner can be credited with a large majority of the photographs displaying the horrific genocidal acts. Wegner was a military nurse and served in the German Sanitary Corps of the Turkish Army during the Armenian Genocide. During his time of service he documented the horrific acts done to the Armenian people through descriptive writings and photographs. Wegner did all of this documenting against direct orders and was eventually arrested by German forces at the request of the Turkish Command. Wegner was forced to relinquish all of his photographs and journal entries to be destroyed, but he was able to save a small number of photographic plates that he hid in his belt. These photographs that Wegner managed to get through the oppressive hands of authority are some of the best evidence we have to date of the atrocities carried out in the Armenian Genocide. Out of Wegner’s array of photographs one in particular seems to show the sheer disregard for Armenian life during these turbulent years. The Wallstein Publishing Company of Germany published the photograph of interest. 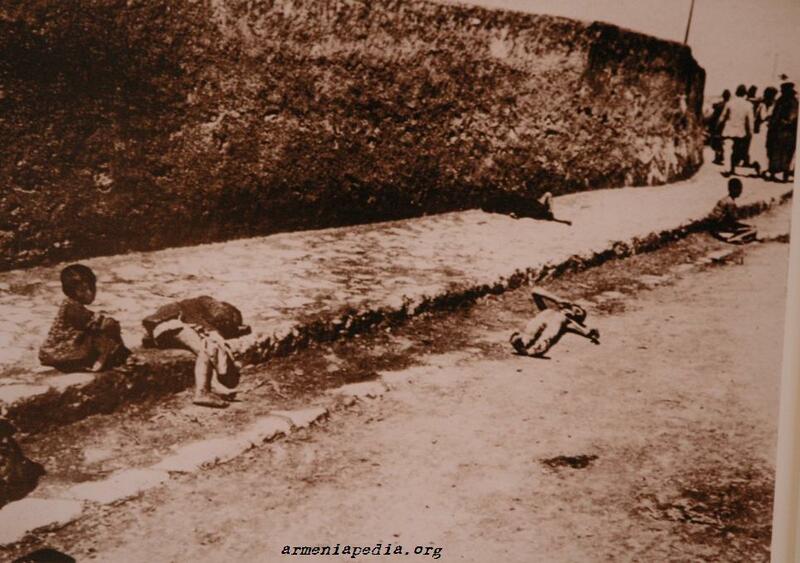 The picture shows five Armenian children scattered on a roadside gutter. Three of the children appear to be deceased, while the other two are sitting in a daze about fifteen feet apart. In the top right corner of the photograph a group of five men in uniform are visible. The men are in uniforms that seem consistent with the Turkish party at that time. The group is walking away from the scattered children with their backs turned away from the horror of the deceased and starving youths. The first living boy in the lower right corner of the photograph doesn’t look any older than seven years old. He is looking directly at Wegner as he takes the photograph. Even though the boy’s face is hard to make out due to the low resolution of the picture it can be seen from his general slumped posture and baggy clothing that he is emaciated and orphaned. There are no caring adults in sight as the boy sits just a foot from the slumped corpse of one of his fellow Armenian youths. The boys gaze looks as though he is distant and somewhat removed from the entire horrific situation, possibly due to the trauma he has endured. Three corpses separate the first living child from the second. The second deceased child lays flat on his back, naked in the street. Some may say that the boy in the street is not dead due to the fact that his arms appear to be up and not laying sprawled at his side. The child being alive or dead might not be an important detail to most, but I think that it needs to be acknowledged that he is dead in the middle of the street, because his positioning means that his corpse cannot be ignored by the passing officers. He is centered in the middle of the road, and therefor requires any passerby’s attention. I believe that the process a human body goes through after death can explain the boy’s odd position. He seems as though he is recently deceased due to the lack of deterioration, and this time period of his death would fall perfectly within the time frame that rigor mortis sets into the limbs of the body. The time frame would be about six hours after death for rigor mortis to set into his limbs (Iserson, 2003), and this would match up quite well with how long the boy appears to have been dead. His corpse is just as emaciated as the other youths present in the photograph. The third dead child positioned in the upper right of the photograph is barely visible. He or she’s legs can only be seen, as the rest of the body is covered by what appears to be a black cloth of some sort. To me it appears as if the child had covered him or herself before death, seeing as none of the other corpses are blanketed. The cloth covering to me may signify that the child knew that he or she was at the end of life and wanted to have the dignity of being covered before death instead of being put on display as a casualty of the genocide. The final child in this photograph is in the upper right corner of the photograph. The boys is alive and sitting up in a slumped position only five or six feet behind the Turkish soldiers retreating from the scene. This boy is not looking at Wegner, but instead has his head turned toward the uniformed men. It is as if the boy is watching death passing over him and his people and retreating in an organized manner. His position is weak and feeble. It seems to perfectly reflect his role in the entire affair. The boy is powerless and can only look on as his tormenters pass by calmly and confidently, destruction left in their wake. The photograph is an image of the ramifications and effects of genocide. The image shows the path of death left by the aggressors. The children are all emaciated and malnourished, which suggests that they have been denied any food or nourishment. They appear to be alone and orphaned. They are not sitting in the wake of war; they are sprawled out in the ravaged path of genocide. What the photograph doesn’t show is just as powerful as what it does show. The picture is absent of any caring parental guardians, or anyone for that matter who seem concerned with the welfare of these children. This lack of adults suggests that these children have lost their parents due to the genocide. They are left to fend for themselves in a land of the dead. This image of dead children reflects so greatly on the genocidal nature of this event because we do not see images like this in wars. Gruesome images of war are often pictures of fallen soldiers, or mutilated enemy troops. The victims in this photograph are not in uniform. They are unarmed. They are lame and defenseless. And above all the victims in this photograph are young children. This is an image of genocide. When writing about this topic I realize that the majority of the World does acknowledge this event, as genocide, but it must also be noted that the state of the aggressors chooses to ignore the event and even denies it’s existence. My purpose in investigating images of this event is simply to further drive home the irrefutable fact that this catastrophe was started with intentions of exterminating the Armenian people as a whole. The reason I choose to focus on the child casualties of this event is because I feel that they are the greatest proof of the genocidal nature of this atrocity. The killing of adults occurs both in genocide and in war, therefor it’s not always the best evidence in defining genocide. There seems to be more logic around the idea of killing those who are older. Adult men and women may be targeted due to the possible physical threat they pose to soldiers of the opposing side. They can actively resist, and cause damage to aggressors. They may also be targeted because adults are more likely to assume leadership roles in a resistance; this is due to the fact that they usually have strong convictions about issues that they have developed through life experience. They also command more respect from the general public and their peers. Adults pose a huge threat to aggressors. Children on the other hand, especially young children, such as those seen in Wegner’s photograph, pose little or no threat to assailants. They are usually not independent in thoughts or action, and they rely heavily on the direction and care of those older than them. The killing and starvation of children truly reflects aggressor intentions to exterminate a group in its entirety. This unjustified distain for a group along with the goal of complete and definite annihilation of a group strikes at the core definition of genocide. An image that I feel is extremely effective in reflecting the crippling power the Young Turks had over the Armenian people is one that can be found in the Collection of The St. Lazar Mkhitarian Congregation. This photograph is another image of young Armenian children. The photograph shows a well dresser Turkish man teasing seven young starving Armenian children with a loaf of bread. The children in this photo are emaciated and weak, just as in Wegner’s photograph. Judging by their fully outstretched hands, they appear to be begging for the bread in the Turkish officer’s hand. You cannot see the faces of the children in this photograph, but judging by their body language, they seem to be extremely anxious about getting the small chunk of bread. All of the children are reaching for the bread, but some seem more enthusiastic than others. The boy all the way in the back of the group has both hands outstretched, but is lying down on his side. The boy just to his right is up on his toes, reaching with his entire body outstretched. Their physical positions seem to reflect their hope for receiving this bread. The boy laying down in the back looks far skinnier and more sickly than any of the other children in the group, at this point in his starvation he may be less hopeful for Turkish generosity than those around him. His begging looks more pitiful and desperate instead of hopeful like some of the children around him. The Turkish officer in this photograph should be focused on as well. The man is well dressed and looks to be nourished; everything about him is in contrast to the starving children around him. He is standing while all but one of the children are sitting. This posture and positioning reflects the power he has over these children and the Armenian population as a whole. The officer’s face is stern and unfeeling in the presence of these starving and lame children. He is uncaring and unremorseful. He is in a position of ultimate power over these children, and holds the key to their survival in his hand. This overwhelming power over a people is greatly reflective of the genocidal nature of this event. In wars or conflicts there may be a side that is stronger than the other, but there is not one side that is completely dominating and in full control of the other. Through the this image of taunted children we are able to pull deeper meaning for the event as a whole. This picture reflects complete control on the side of the Yong Turks. The soldier symbolically holds life in his hands, and teases the Armenian children with it. Life is just out the of the Children’s grasp. It seems clear that the event that occurred was clearly genocide, and it’s surprising that the Turkish nation could disregard its existence. The two images discussed above reflected the malice of the event through the investigation of the child victims. The killing of children seems to be more highly reflective of a desire to exterminate a population. One may ask though, why is it even important that Turkey acknowledge the genocide if the rest of the World knows the truth? What is the significance of the perpetrating nation acknowledging their wrongdoing? The solution to these questions can be answered by a concept that Adam Jones brings up repeatedly in his book, “Genocide: A Comprehensive Introduction”. The term that Jones references is called, “Restorative justice”. Restorative justice is the idea that steps must be taken by aggressors and victims after genocide has occurred in order to find some sense of closure in the affair. Jones says that the goal of restorative justice is that it, “Seeks repair of social connections and peace rather than retribution against the offenders” (Jones, 2011, p. 552). Even though some of the offenders of this genocide were convicted shortly after the atrocities ended, very few of these convictions were followed through with, and ultimately the entire process of trying the criminals fell by the wayside. This form of justice (if any was truly done) was not restorative in the least and instead was striving for more retributive outcomes. This retribution and punishment many times is not what victims truly need in order to feel closure in an event. Simply telling offenders that what they did is wrong does not bring about closure, the offenders must say on their own accord that what they did was wrong and they are truly sorry for what has occurred. This restorative justice was not able to occur in the case of the Armenian genocide due to the fact that the offending Young Turks never admitted to their wrongdoings and ultimately never apologized for what they did to the Armenians. It is so important that the Turkish nation at least recognize the events that took place as genocide because without that recognition from the aggressors there will always be a felling of emptiness and lack of resolution for the Armenian people. Even though the rest of the World recognizes the validity of the Armenian Genocide there will never be closure until the Turkish nation admits to their wrongdoings. The images of this event clearly exhibit its genocidal nature, and it’s malicious control over the fates of the Armenian people. More specifically the images of Armenian children seem to strike at the core of what was motivating the Young Turks. The Young Turks were not in a violent engagement with the Armenian people, but were instead part of a one-sided brutal massacre of the Armenian’s as a whole. The act of killing children reflects desires to exterminate a group as a whole because young children pose no direct or urgent military threat to an opposing army. These events cannot be labeled as anything other than a genocide and it would be ignorant and in poor taste to say otherwise. Until the Turkish nation recognizes the events that took place as genocide there is no hope for closure or reconciliation between the two groups. The silence hurts more than what has been done. Jones, A. (2011). Justice, Truth, And Redress. In Genocide: A Comprehensive Introduction. (2nd ed.). (p. 552). New York, United States: Routledge.